I like to cook sometimes, and other times I really want something good, special and super quick. Well I have a Quiche recipe that is all of that. Kind of one of those instant dishes. Crack 6 eggs into a bowl and whisk well, add 1 cup of milk ( I use 2% - less fat ). 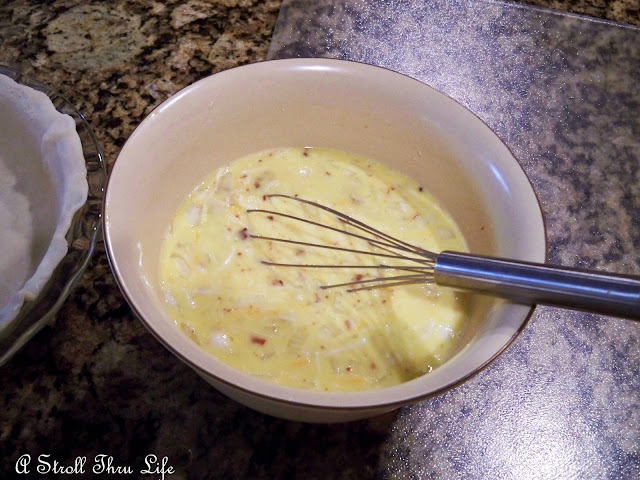 Whisk well again, then add 1/2 bottle real bacon bits, 1/2 c. chopped onion (optional) and 1 cup shredded cheese. Whisk this all together really well. I cheat and use a ready made pie crust that you just unroll into a pie pan. 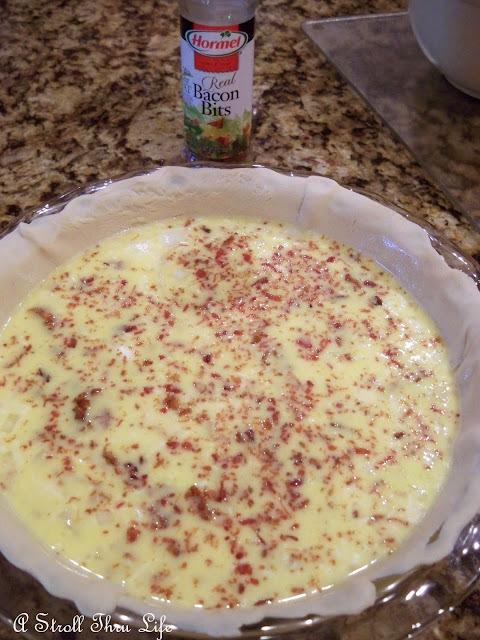 Pour the mixture into the crust and sprinkle more bacon bits on top. Place in preheated 400 degree oven for 15 minutes, reduce heat to 350 and bake for an additional 25 to 35 minutes. When the top starts to brown and a knife inserted in the center is clean, you are ready. Total ingredients for such a great meal. Something we all have in our pantry all the time. Enjoy. Perfect for anytime you need a meal with little fuss and always sooooooo good. Thanks for a great recipe. This is my kind of dish. I'm pinning it, too - now that I've learned how to do that! Looks wonderful Marty. I will give it a try. I look forward to trying this! Thanks a bunch for sharing! Ilve quiche and specially if I can cheat a little, lol! Yours sounds great! Thanks for the idea, I'll make one tonight for dinner, I like fast and no nonsense too! Have a nice week. This recipe looks delish and easy enough. We love quiches. Thanks for sharing! Yum! Now I am hungry. :-D Thanks for sharing the recipe. Hope you are enjoying the weekend. Oh my gosh Marty that looks so good! 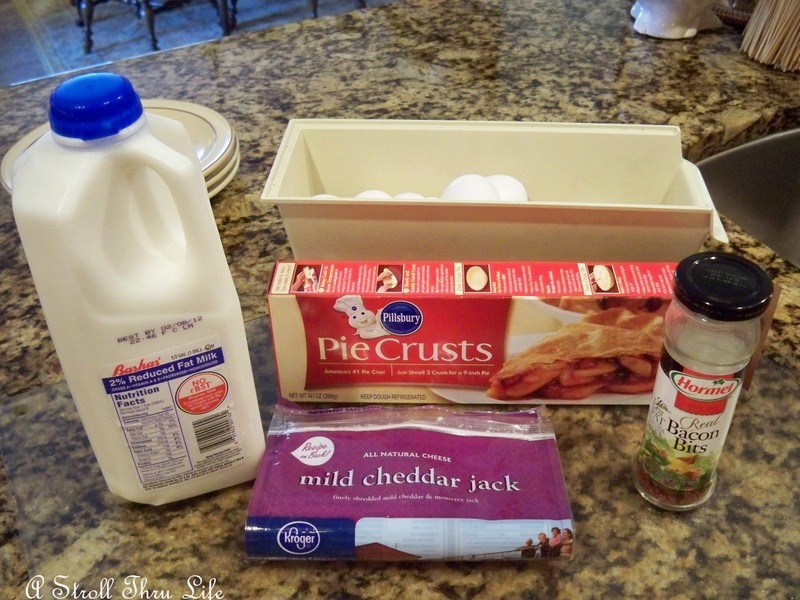 I have all the ingredients on hand except for the pie crust, if I had that I would be making this today!! Definitely trying this! PS- this is a dish my VERY fussy son would LOVE! This looks delicious Marty! I am a big fan of quiche! And I agree, just add a salad and it's a quick and easy dinner! I love quiche, and this does look so easy and delish. Yum! 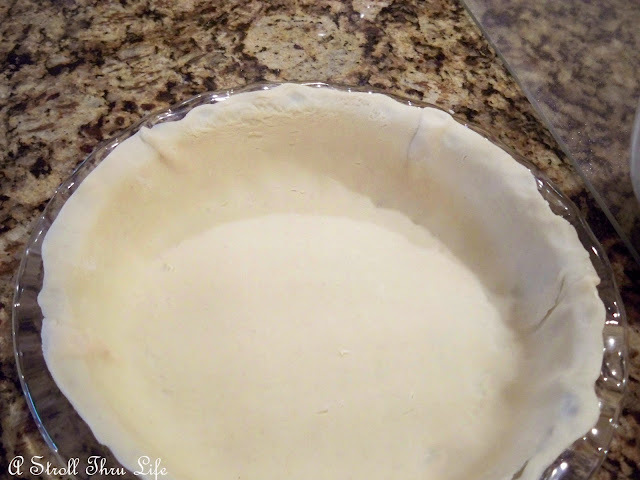 I pinned it until I can get to the store and get some more eggs and a pie crust! I made the hubby some homemade egg salad this morning so I'm outta eggs! Thanks for sharing! Yum. Love bacon. Need to try this dish. There is nothing like a good bacon quiche -- for breakfast, lunch OR dinner! I just made a quiche the other night very similar to yours except I round up all the odds and ends of veggies and cheeses in the frig and throw it all together. It always comes out great and is a great way to use up all those little bits of things! You know, quiche is just one of my favorite things to make...quick, easy, a great way to use dabs of what's in the fridge. looks gorgeous, delicious and easy, Marty! thanks for sharing, a must try! My kinda recipe...a keeper for my files! I could eat this any time...breakfast, lunch or dinner! Thanks for sharing! That looks yummy! I love quiche. The good thing is that you can eat it for any meal. I haven't made quiche in a while. Hmmmm....I might ought to try your recipe. Thanks for sharing. Semi-homemade is my favorite way too. Wow does this look yummy and so easy, even I could make it! LOL! This looks yummy I am going to try it. Thanks for posting . 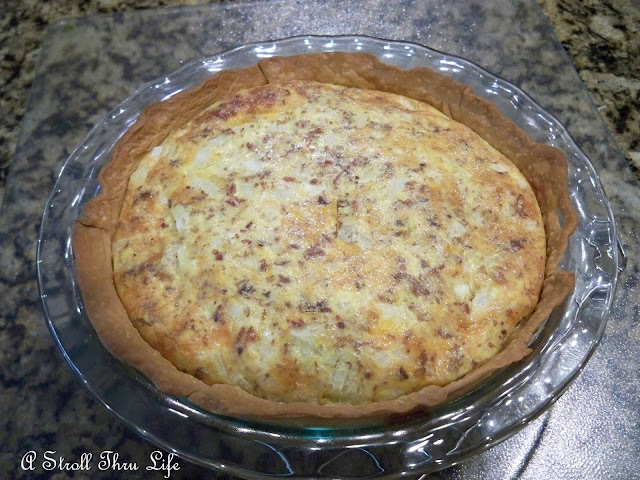 Thanks for sharing your quiche recipe, love quiche & it looks so good, yum! I copied this and will definitely be trying. I love to make quick yet yummy dishes for weekends. I have a wonderful ham quiche recipe that is easy (maybe not as easy as yours) and yummy...made with cream cheese:) Thanks for sharing. Oh yuuum...Always looking for an EASY recipe...thank you...Looks great and can't wait to try it! Great easy recipe Marty. Thats what I like about it and we all do have those things on hand.Thanks for sharing. Also I do watch Semi Homemade with Sandra lee. Love her to death. I Like most of her food and her tablescapes are beautiful. Looks delicious and easy. Easy is the best part. Believe it or not, I made quiche for the first time in my life over Christmas. Yeah, I know... What in the world took me so long? Hi Marty, A great dish for brunch, easy recipe. 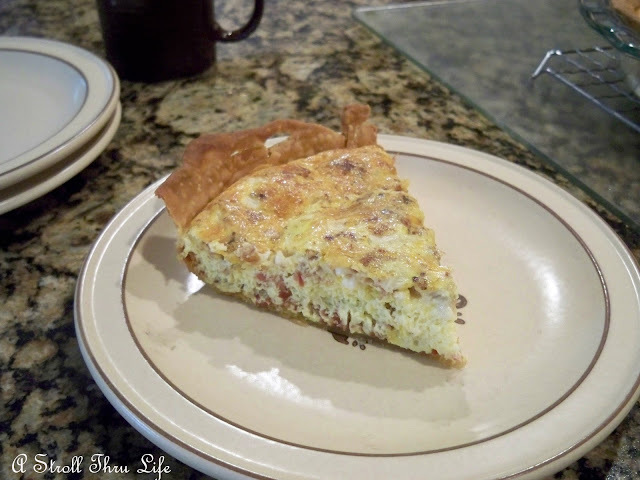 I love quiche and am always looking for quick recipes! This one looks great Marty! I have never made quiche before in my life, but this looks super easy. And yummy! This looks and sounds yummy! I love Bacon Quiche! Thanks for sharing such a great recipe!